COCOA BEACH, Florida -- A mechanical failure at the City of Cocoa Beach's wastewater treatment facility has resulted in a temporary inability to fully process the City's sewage. The failure occurred in a portion of the facility that has been retained while construction-renovations are underway. The wastewater treatment facility is designed to operate parallel systems - two separate treatment plants, each capable of processing over 3 million gallons of influent on a daily basis. Under normal conditions, both plants are used to process the City's wastewater which results in a beneficial by-product in the form of reclaimed water for residential and commercial landscape irrigation. Presently, the facility is undergoing a $14 Million renovation to comply with state mandates regarding the amount of nutrients (i.e., phosphorus and nitrogen) that must be removed from treated water before it can be discharged. In an emergency and/or extended repair situation, one plant can be shut down leaving the remaining system engaged to handle the full workload. Due to the current renovation operations, it was necessary to shut down Plant #1. The problem that occurred late last week was that Plant #2 experienced a mechanical failure and currently remains temporarily unable to fully process incoming influent. Two concerns are that: (1) Partially treated wastewater (i.e., dosed with chlorine) is being discharged into the multi-lake-system on the City's golf course. 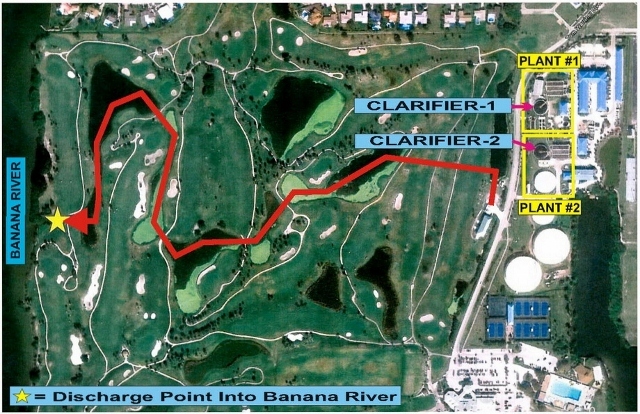 This partially-treated water could gradually wind its way into the Banana River (see red discharge-flow arrow in photo above); and, (2) the City's wastewater treatment facility will be unable to produce any re-claimed/re-use water for distribution throughout the City until further notice. As a precaution, signage has been installed on affected golf course area lakes to inform golfers of the situation. Department of Health and Florida Department of Environmental Protection authorities have been notified of the problem and are available to offer assistance, as necessary. According to Wastewater Treatment Facility Director, Darby Blanchard, none of the partially-treated wastewater discharge has reached the Banana River. She further stated that emergency repairs are on-going and hopefully the facility will be back in operation within the next few days.